Used For: The herb is used to relieve inflammatory conditions, treat bacterial infections, and relieve fevers. 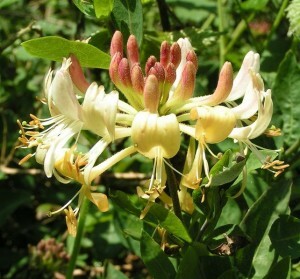 Honeysuckle flowers are applied for a wide range of bacterial infections and inflammations. Particularly, it is applied for respiratory tract conditions, but may also be used for a variety of digestive tract inflammatory conditions. Moreover, it is beneficial for influenza, sore throat, common cold, and fevers. Preparation and Intake: The herb is used at a dose of 6-15 grams. Its large amounts may be efficiently applied in acute conditions, although, medical control is an absolute must. Safety: The plant is not recommended to people suffering from stomach and spleen deficiency, as well as in case of diarrhea or cold. Exercise care when applying it for sores induced by yin or qi deficiency.